These last few blog entries have all been about culinary victories. Dishes that defeated me, at first, but which I later conquered. Today’s blog entry is one for my son, Brendon. 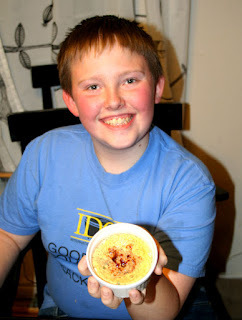 Several times, now, he’s tried to do a creme brulee, each time it didn’t turn out quite the way we wanted. Once it was a bit bland and strangely grey in color, another time it didn’t set and was almost completely liquid. Finally, we took a little time and did it together. Actually, he did it, and with only minimal observation and input from me. And it worked! 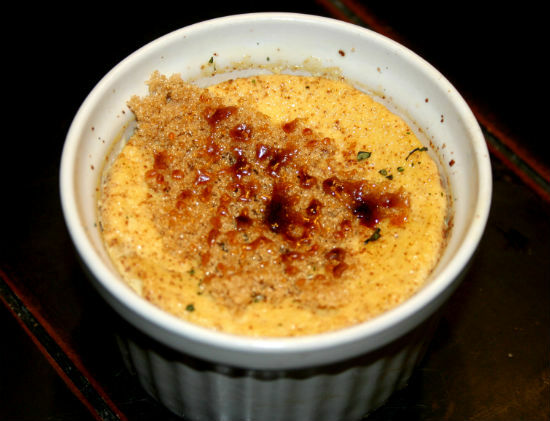 This recipe is based on one from America’s Test Kitchen. It’s a little bit different, simplified in process from so many others we looked up, and adapted a little, of course, for the Dutch oven. We also had to shop around some to find ramekins. It was tricky to buy them, wondering how many we would be able to fit into the Dutch oven. The small, but deep round ones would easily fit 7, but the larger, shallower, ovals would only fit 4. Your mileage may vary. You’ll also need a blowtorch. Yes, I said that right. We borrowed a small plumber’s torch from a neighbor. You can go out and spend about $30 for a small kitchen torch. That’s a bit too much to spend on a unitasker for me..
You’ll also need several 4-5 oz ceramic ramekins. To start, we got some coals lit. While those were catching on, we put the ramekins in the Dutch oven and poured water in to about ¾ of the way up the sides of the ramekins. Then we removed them and set them aside. When the coals were ready, we spread them around and set the Dutch oven on top, with the lid on, to let the water boil. Then we turned our attention to the custard itself. Brendon began by separating the egg yolks from the whites. 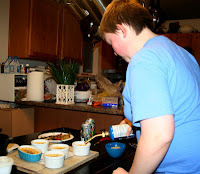 While Jacob, his assistant whisked the yolks, Brendon mixed the other (second set) ingredients in a bowl. Finally, while whisking, Brendon slowly combined the yolks and the cream mix. A few final whisks, and it was done. Then, the mix was poured into the ramekins, and evened out. Soon after, the water was at a nice even boil, and Brendon gently set the ramekins into the water. It was kinda tricky, but wearing leather gloves helped. We put the lid back on and adjusted the coals to be on the bottom and the top, as above. We let it cook for about 35 to 40 minutes. Occasionally we’d check the set of the custard and the current temperature. You want to cook it to 170-175 degrees F, and until the centers are jiggly, but not sloshy. We pulled it off the coals, and pulled out the ramekins, letting them cool on a rack. Once they’d cooled a bit, Brendon put them in the fridge to chill. They continued to set a bit as they cooled, and even more as they chilled. After our dinner, brimming with excitement, Brendon fetched the ramekins and the torch. This final step isn’t correctly done unless it’s performed in front of the diners. He sprinkled a little bit of sugar atop each one, and fired it up (what is it about young boys and fire?). Keeping the torch moving, he melted the sugar into a crust. Then he sprinkled on some mint and handed it to our guest and family, proud as can be. It was delicious. And, we chalked up another victory! Will have to try it this way! 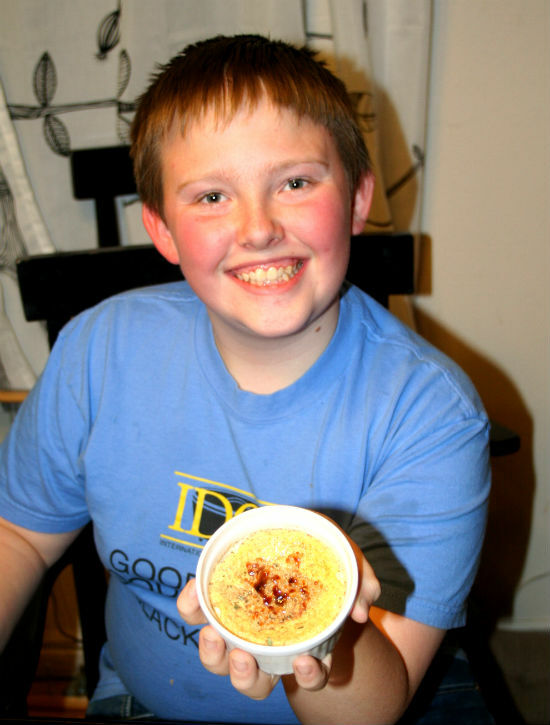 That is not an easy dessert to make, nicely done Brendon!